Lisa made this dish tonight, from Elise’s Simply Recipes, to go with the black bean burgers. 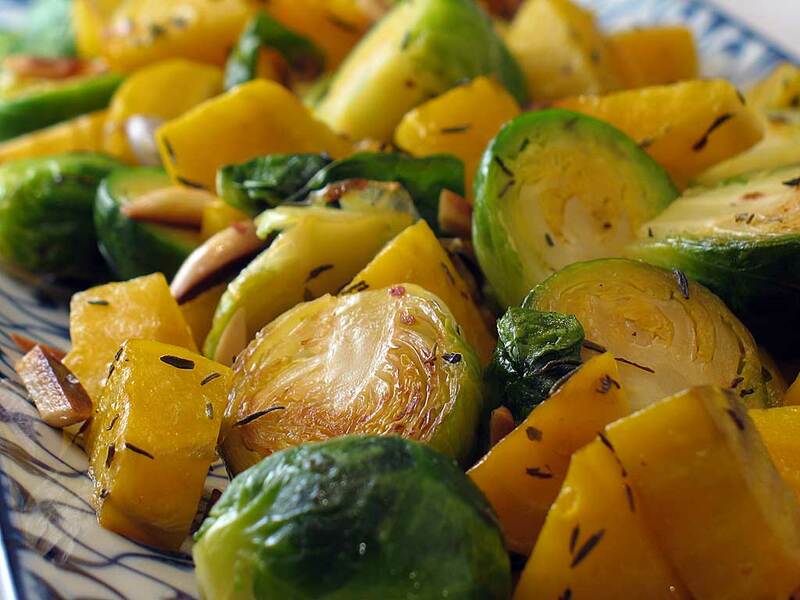 Roasted beets and parboiled Brussels sprouts are quickly sauteed in a pan with roasted almonds, shallots, and thyme. How come I like Brussels sprouts all of a sudden? But every time I’ve had them they’ve either been really bitter, or so disguised that you couldn’t even taste them at all — these are awesome. You finally had them cooked right, sucka. Wow, I might like these even more than the ones we made at Thanksgiving. Delicious! It’s a great recipe — though I cut the oil in half, and I’d call it 2-3 servings, not 3-4. Place the beets in a roasting pan, and place in a 350 degree oven for an hour and fifteen minutes. When beets are done, remove from the pan, let cool for 10 minutes, then peel and cut into 1-1/2″ chunks. While beets are roasting, toast raw almonds in a pan over medium heat until browned, then set aside. Fill a small saucepan halfway with water and bring to a boil. Add the brussels sprouts and cook for 2-3 minutes, until almost cooked through. Drain, let cool, then cut in half and chop off protruding stems. In a skillet over medium heat add half a tablespoon of the oil. Add the shallots and cook until translucent, then add another half tablespoon of oil and raise the heat to medium-high. Add the sprouts, beets, and thyme, stirring as you go. Add salt and pepper to taste. Cook for an additional minute, then toss with the toasted almonds. This entry was posted on Wednesday, January 9th, 2008 at 10:35 pm	and is filed under Sides. You can follow any responses to this entry through the RSS 2.0 feed. You can leave a response, or trackback from your own site. The dish looks wonderful – great photo! I agree with Patricia– what a beautiful photo. My husband and I have had the same conversation about Brussels sprouts. He’s liked them since he was a little boy, but I’m still not 100% about them. I love the idea of having them with the sweetness of beets. Delicious! Patricia — Thanks! I like the photo too. Hanne Hanne — What I really liked about these was that they didn’t have that “bitter” taste I usually associate with them. Maybe because they’re cooked so quickly? They were cooked, yet still crisp. I really, really enjoyed them. Gotta be delicious. Will try as soon as we can get to Wegmans for the golden beets. Your GREAT photo should win an award of some type! I love brussels sprouts in a maple vinaigrette, but I’d definitely give this a try! could you use regular beets? I can’t get golden beets anywhere around here. Hanna — I’m sure you could, but I’d fear it turning the entire dish red. Long live the Brussels sprout! Listen to your smart wife–they rock! Pair them with beets–the ultimate combination! This looks soooooo yummy….. I had to make this without the Brussels Sprouts, due to my husband’s terrible chronic bloating condition. Even without them, it was a delicious dish, which we will make again when our wallets afford it, since golden beets are a bit pricy at Wegman’s. How about using red beets? Any major flavor change or just presentation?